Sidelined by shoulder injury lasting more than a year, Rolf Kasparek returns with the 2016 version of his band Running Wild and a new album, the seventeenth, Rapid Foray. As usual the German metal legend keeps the pirate motif intact and always a bit tongue in cheek also. 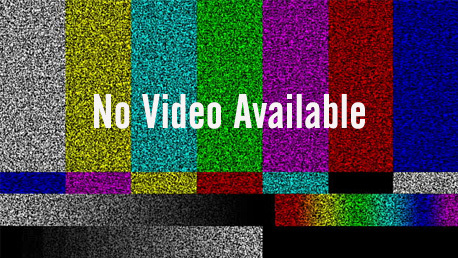 To say that Rapid Foray is basically standad Rock N Rolf and Running Wild fare is not to be condescending or dismissive. After 30 some years Kasparek doesn't mess with his musical formula all that much. 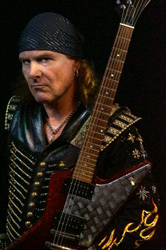 Twin guitar harmony, solid rock groove, his raspy vocals wrapped in essential vocal harmony, tempos from steady to the speed of power metal, and an abundance of roaring guitar solos are the main ingredients that form every song. When these things gel together, Running Wild creates some memorable classic "keep it true" heavy metal. By The Blood In Your Heart is one example where riffs, groove, and an ambitious vocal arrangement make for an arena anthem tune. That song along with Stick To Your Guns and Rapid Foray point to another significant feature: the interplay between bass and drums that start the songs. Alternatively, the collection of songs Black Bart, Hellestrified, Blood Moon Rising, and Into The West seem stripped down to heavy metal essentials: riffs, speed, more riffs, and stinging solos. You could call this rudimentary or generic heavy metal, but it's still Running Wild's bread and butter. As I've said in the past of recent releases, if you're a Running Wild fan and liked most anything they've done from past to present, you will enjoy Rapid Foray. They're not reinventing the wheel, just keeping their heavy metal wheels rolling. 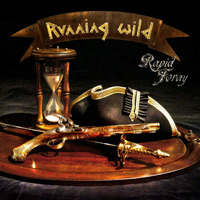 As I've said in the past of recent releases, if you're a Running Wild fan and liked most anything they've done from past to present, you will enjoy Rapid Foray.